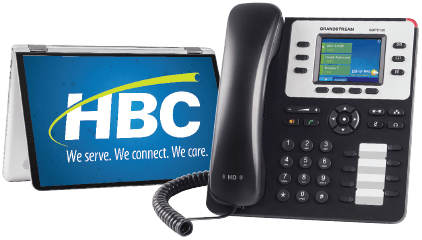 HBC makes your business more productive by serving as a single point of contact for all your communication needs. We can help you with today, and your plans for the future. HBC’s fiber-optic network offers flexible bandwidth and networking solutions for businesses of any size. Keep your business connected with reliable HBC voice and calling services. Bring your customers the best in news, entertainment, sports, and music with HBC Video services. Boost your business’s efficiency and productivity with the ultimate in Internet + Phone GigaBiz Packages. Get robust Internet service with your choice of speed, combined with technologically-rich Phone service. Applicable equipment, fees, taxes, or other charges not included. Many factors affect speed. Actual speed may vary. Some restrictions may apply. Video service discount is not valid for taverns, restaurants, or bars. 10% Video discount is only applicable to Basic, Expanded Business Essentials, Expanded Business Complete, and Digital Plus Video options. Call centers are not eligible for GigaBiz Choice Packages. Get the features of a big business phone system in a low-cost managed service offering. With TV advertising, your message is guaranteed to reach a variety of audiences in local markets. HBC’s production team will bring your message to life.